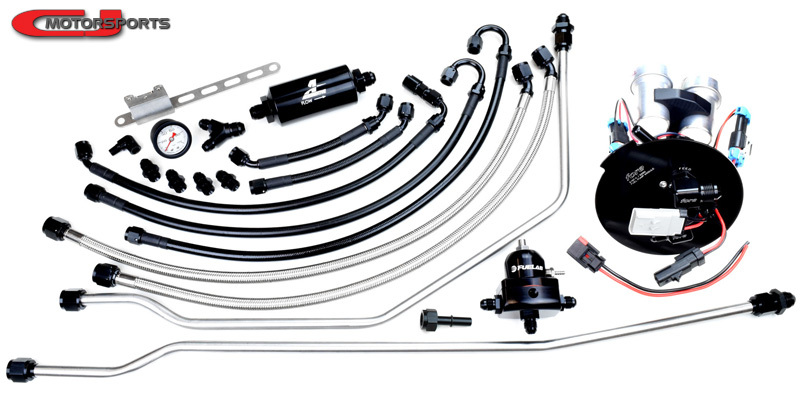 CJ Motorsports has put together a comprehensive and practical fuel system kit tailored specifically for the S550 Mustang equipped with the popular Whipple Supercharger system. With 2 years of testing on our own vehicle, we have decided to bring the kit to market. A Fore Innovations Twin Pump is at the heart of the system. We add OEM wiring connectors to the Fore product to improve your installation. In fact, the primary pump and level sensor is PnP with our addition, so you will not need to modify your factory fuel pump wiring AT ALL. We include a 2-piece rigid stainless pipe (with 8AN ends) to carry fuel from the pump to the engine bay. This pipe conveniently fits in an unused position available in all the original fuel delivery pipe holders already underneath your chassis. An inline Aeromotive 10 micron E85 compatible filter attaches underneath the vehicle as well. Since the factory feed pipe is high quality and an adequate size for a twin pump, rather than have you tear it out, we include adapters for each end, allowing you to re-purpose it as the return line. A billet Y-block and PTFE hoses with stainless braiding and black PVC coating provide parallel plumbing from the feed pipe to the rails, and from the rails to the regulator. Black aluminum 6AN adapter fittings with Viton o-rings are included for adding to your Whipple fuel rails. Our custom stainless regulator mount positions the regulator at the back of the blower. A mini fuel pressure gauge is included for setting your base pressure to your tuner's required setting. This quality insulation for -6 hoses is highly recommended for protecting soft hoses from high heat. 6 feet will sufficiently protect engine bay hoses with this kit. Add a fuel pump relay kit and a Honeywell pressure switch to provide quality fused power for the secondary/aux fuel pump in your Fore twin pump. Install the pressure switch in the engine bay with a vacuum hose to the intake manifold, and wire it to the aux pump relay switch. When you reach ~4-5 psi boost, the switch will activate the second fuel pump. Fuel Injectors: Select appropriately sized fuel injectors to go with your new fuel system. Fore Innovations Twin Pump w/ CJM Wiring Added: This fuel system starts with a Fore Innovation Twin Pump in the fuel tank. 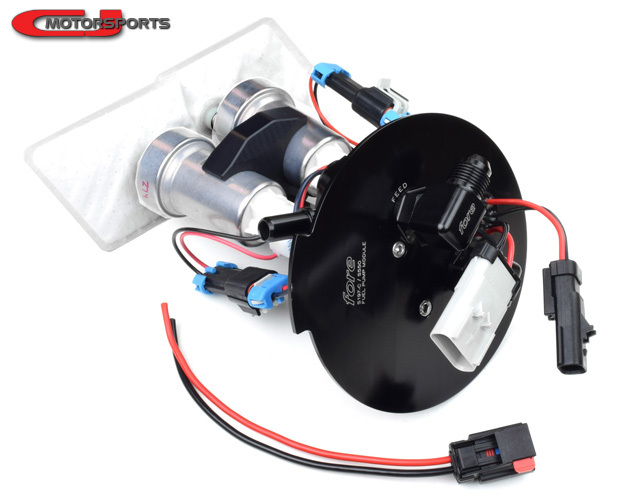 Equipped with twin Walbro 450s (274 High Pressure Model), this fuel pump package is the perfect match for an E85 conversion with your Whipple SC system. We add connectors to the twin pump wiring to improve and ease your installation. One connector is PnP with your factory fuel pump connector, giving you a functional primary fuel pump and fuel level sensor before having to perform any wiring. This means you can test the system and even run the car (to the limits of a single 450 pump) before having to begin any wiring work. Another connector is added for the secondary pump, as well as a pigtail harness connector for you to easily interface with it. 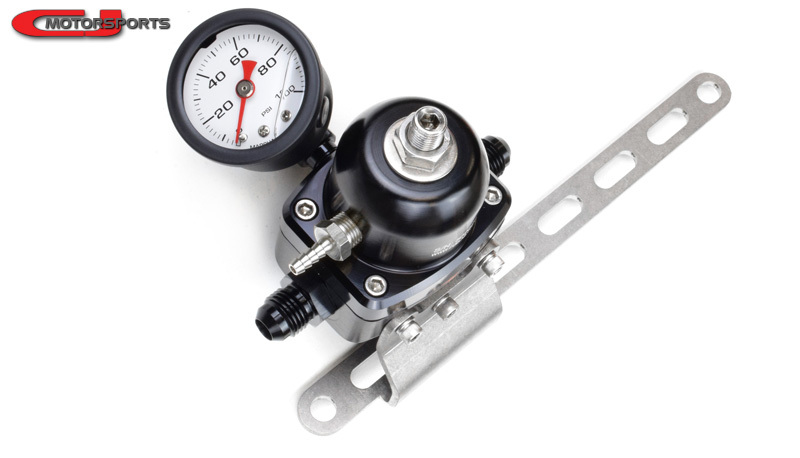 Regulator Kit: This package includes a compact Fuelab regulator. The necessary adapter fittings are included to interface with the plumbing kit, as well as a pressure gauge and elbow fitting, and a custom stainless steel bracket for mounting the regulator to the rear end of the blower. Connect a vacuum/boost reference line for a 1:1 constant pressure ratio. All hoses are PTFE with stainless braid. Engine bay hoses have black PVC coating over the braid for abrasion resistance. -8 Fuel Pump to Hard-pipe Hose. -8 (1/2") Stainless Feed Pipe (2-piece). Aeromotive 10 Micron Micro-Glass Filter. Billet -8 Y-Block to Twin -6 Fuel Rail Inlet Hoses. 6AN Adapter Fittings, for Whipple Rails. QD Adapter for Original Feed Line to Return Fitting at Pump.